Are you a nurse or doctor? If yes- thank you for all that you are doing to move the industry forward while recommending cannabis to your patients. It delights us when we hear positive wellness stories and learn more about how cannabis is improving lives. If you’re not a trained medical professional and work in a dispensary- thank you for being really clear with patients. When they ask for your suggestion and insight about the ways cannabis may assist them, please say things like “I’m not a Doctor.” “Please check with your medical team.” Of course you may still share information, and let’s make sure it’s anecdotal or general, staying away from making claims and medical assurances. Several recent articles are bringing “medtending’ onto our radar. It is illegal to provide medical advice, unless you are a doctor. There can be huge fines for crossing this line. The Denver Post recently reported that they “found that employees at 69 percent of stores (in CO) recommended treating pregnancy-related nausea with cannabis.” This contradicts what several studies, health experts, and even industry advocates have said about discouraging cannabis use with pregnancy. 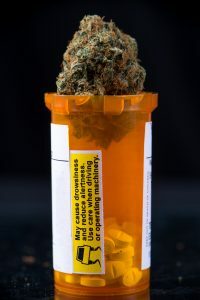 Josh Ingold, with The Denver Post, reported that they “found that employees at 69 percent of stores (in CO) recommended treating pregnancy-related nausea with cannabis.” This contradicts what several studies, health experts, and even industry advocates have said about discouraging cannabis use with pregnancy. But a new study by doctors at Denver Health and the University of Colorado School of Medicine reports that, when asked for advice on mixing pot and pregnancy, employees at an overwhelming majority of marijuana stores in Colorado will say that it’s OK. And fewer than a third of those stores will recommend that a pregnant woman consult with a doctor about cannabis use — unless they are prompted to. One of those data points came out last month, when separate researchers at CU found that marijuana use during pregnancy was associated with low birth weights. Dr. Larry Wolk, a pediatrician and executive director of the Colorado Department of Public Health and Environment, said the new findings are concerning — especially considering how much work has gone into discouraging marijuana use during pregnancy. But, he said, other survey data do not yet show an alarming increase in the number of women using marijuana during pregnancy. Between 2014 and 2016, the percentage of women who said they used marijuana while pregnant or breast-feeding did not increase significantly, according to the latest numbers available from the Colorado Pregnancy Risk Assessment Monitoring System. In 2016, about 8 percent of women surveyed used marijuana during pregnancy — similar to the percentage of women who smoked cigarettes while pregnant and slightly less than half the percentage of women who said they drank alcohol. Women who said their pregnancy was unintentional were more likely to have used marijuana — suggesting that, for at least some women, their marijuana use may have come during a time when they were unaware they were pregnant. Those numbers lead Wolk to argue that there isn’t an epidemic of marijuana use during pregnancy, which only makes the new study more concerning. “If this is the information they are giving out, that could erode and we could see an increase,” he said. The results of the new study come with a caveat: They were obtained with a little bit of subterfuge. To carry out the study, researchers called 400 Colorado marijuana stores, both medical and recreational, and told the employee who answered that they were eight weeks pregnant and suffering from nausea. “Are there any products that are recommended for morning sickness?” the researcher would ask, sticking to a script. They found that employees at 69 percent of stores recommended treating pregnancy-related nausea with cannabis. Only 32 percent of stores recommended consulting a doctor — although that percentage grew to 82 percent if the caller directly asked whether she should consult a doctor. Metz said the study set-up was “as close as we can get in a study to replicating the real world.” And she said she is confident that the answers researchers received over the phone are the same as what a store employee would tell a customer in person. The specifics of the advice that researchers heard, though, were all over the place. Some employees recommended using a product high in THC, the psychoactive component of marijuana. Others recommended a product containing only CBD, which does not get users high. Some expressed caution about recommending marijuana without consult from a doctor, while others specifically noted the packaging labels warning against using cannabis while pregnant — and then recommended it anyway. Sometimes, the employees lacked a basic understanding of biology. To Wolk, this shows the real problem. “I think people have to be careful of the kind of information they’re asking of a budtender because these are not health care people,” he said. Wolk said the state will next month launch a new public-education campaign focused on marijuana and pregnancy. The campaign will specifically focus on reaching people who are already consuming marijuana, as a recent state study found that marijuana consumers are much less likely to believe that using marijuana once or twice during pregnancy could be harmful. Kristi Kelly, the executive director of the Colorado-based Marijuana Industry Group, said the study also provides an opportunity for the industry and the medical community to work together. Store employees should be reminded not to provide medical advice, she said. But doctors, she said, should remember that patients curious about marijuana are going to try to seek out information from many different sources. “It makes sense that we would work closely with the medical and scientific community to figure out the most effective way to provide education content to customers,” she said. I’m calling because I’m eight weeks pregnant and nauseated. Are there any products that are recommended for morning sickness? Why is the product recommended or not recommended? Is cannabis safe to take during pregnancy? Cannabis Trainers™ offers compliance training programs for dispensary staff. We coach people in our Sell-SMaRT™ Responsible Vendor training not to give medical advice. For more topics on our blog, join us here! It’s interesting that with medical marijuana being so new of a treatment, that medical professionals and scientists are still studying how it affects people. Personally, I think it’s great that they are looking for effective ways to share their research with people who go to a cannabis dispensary. I would imagine that a cannabis dispensary would be able to give advice on how much cannabis is considered healthy, but providing information pamphlets with the answers to common questions would also be helpful.